Columbia College has made some changes that will accelerate your ability to fulfill your degree requirements. Recently Columbia College added an eight-week session per academic school year, moving from five each year to six. The additional eight-week session gives students the opportunity to complete more classes in an academic school year. In addition to the extra session, Columbia College has also made it possible to take up to three classes per eight-week session. Before these changes, students could complete up to 10 classes a year (or 30 credit hours). Now students are able to complete up to eighteen classes (or 54 credit hours) in one academic school year. Pursuing a degree is a big commitment, and personal sacrifices have to be made to excel at being a successful student. Now you can strive to reach your goals within a shorter time and limit the time you spend sacrificing. Columbia College is giving students an opportunity to earn their degree in a fraction of the time that it traditionally takes to earn a degree. With hard work and dedication, students can now earn a bachelor’s degree in just more than two years, versus four years traditionally. Whether it’s a brand new career that you’re excited about, or maybe a promotion at the job that you’re currently working, no matter what your educational goals are, you are now able to achieve them faster at Columbia College and our Fort Stewart location. The holiday season has come and gone and, more likely than not, your credit card bills have swollen with the weight of the gifts you purchased for family and friends. Some of you may have taken credit card companies up on seasonal low interest rate offers in order to lessen the burden as well. If a company is offering to let you pay off a four-figure debt over the next year with 0 percent interest, how can there be a downside? Sometimes companies hide them in the fine print of the agreements, according to Rachel Smith, senior advisor at Columbia College’s Student Success office. In an article called “How Credit Card Promotional Rates Work,” TheBalance.com highlights the key tenets of these potentially useful, yet potentially damaging, deals. How long do they last? : Federal law mandates at least six months, but some of the best deals can last up to a year and a half. Some credit card companies measure the rates through billing cycles rather than months, so be on the lookout for that as well. Also, be sure to make your payments on time. 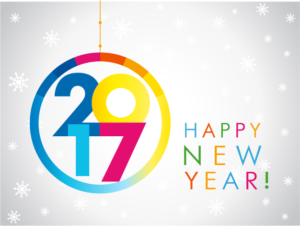 Some rates expire before the end of the promotional period if you’re more than 60 days late on your credit card payment. Check the rate after the promotional period: Before you enter into a low interest rate agreement, find out what the post-promotional rate will be. Sometimes, an inflated rate after the promotional period makes it so that it’s not worth it to sign on for a low interest rate during the deal. 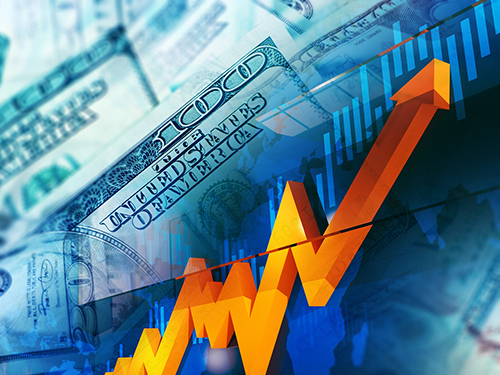 It’s not the same as deferred interest: Even though companies may use similar phrasing to promote low-interest rate introductory offers and deferred interest plans, they are not the same thing. With a deferred interest plan, you have to pay the full credit card balance in order to pay no interest. If you have any balance left after the promotional period, you’re on the hook for the full interest backdated to the first day the balance was added to your account. For more tips on financial awareness, you can check out the Student Success Money Stacks page, email moneystacks@ccis.edu or call (573) 875-7860. Columbia College is far more than just its Day Campus. We would not be where we are today without the students and alumni from our 35 Nationwide locations, Evening Campus and the Online Education program as well. That’s why, when it came to planning out the Quad — the new heart of our Columbia, Missouri, campus — we made sure that our national footprint played a prominent part. 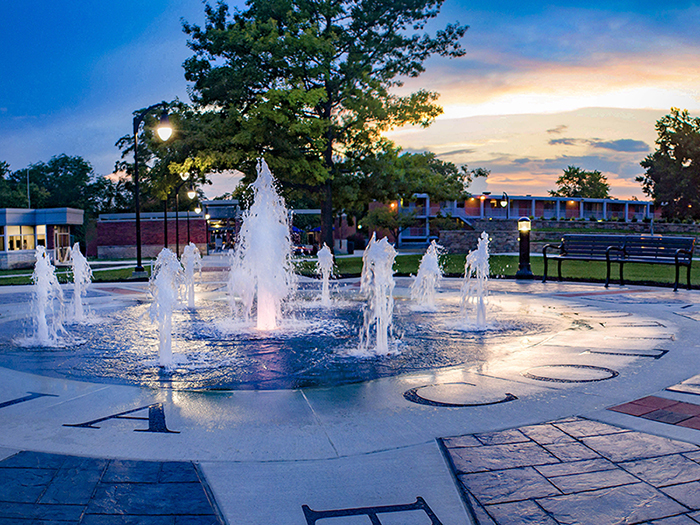 To honor our more than 83,000 alumni living worldwide as well as all the locations that make up the whole of Columbia College, we positioned Alumni Fountain as the centerpiece of the Quad. 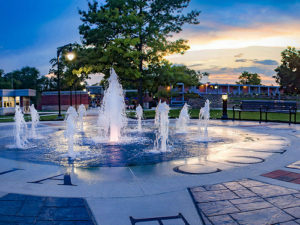 The fountain has one center jet of water, representing main campus, with eight smaller jets arranged around it to represent the Nationwide locations’ contribution to Columbia College. Not only that, but the fountain also serves as a sort of compass, with bricks bearing the name of each Nationwide location and arranged geographically around the center of the fountain in the direction they are from the main campus. Alumni Fountain turned on for the first time August 29, the first day of classes, and it took students less than a minute to make a sprint through the jets! On October 7, President Scott Dalrymple officially dedicated the rest of the Quad at a ceremony in which more than 100 members from the community showed up to help celebrate. We hope that those of you who have had the opportunity to visit our beautiful campus will make a return trip at some point to check out the Quad. And, if you’ve never made it to Columbia, we hope you’ll stop by and check out all we have to offer. Be sure to visit ccis.edu/quad for more information. Have you ever thought about using your Facebook, Google Plus, LinkedIn or Twitter accounts to help further your professional life? While their primary purpose is expanding and deepening someone’s network of personal connections, the many platforms that make up social media can also serve as invaluable resources when you’re looking to land a job or further your career. That is, if you know how to use them correctly. A 2012 CareerBuilder.com survey found that 37 percent of the more than 2,300 hiring managers and human resources professionals the site polled use social networks to vet job candidates. Of those companies, 65 percent said they did it to see if the potential candidate presents him or herself professionally. “Social media is a primary vehicle of communication today, and because much of that communication is public, it’s no surprise some recruiters and hiring managers are tuning in,” CareerBuilder vice president of human resources Rosemary Haefner told Forbes.com. So how do you put your best foot forward? Forbes (“Ten Ways to Use LinkedIn in Your Job Search”) and TheMuse.com (“45 Things Successful Job Seekers Do on Social Media”) both have helpful articles on the topic. Show Your Personality: Don’t start these accounts just to have them. Actually go on Facebook, Twitter, etc., read what others are posting about and develop some content of your own that shows off your individuality. Comment on others’ posts. Share articles that interest you, or that you find interesting about the field in which you work. Spread Your Wings: Don’t be afraid to expand your social circle beyond your immediate sphere of friends and family. Forbes suggests remaining vigilant on LinkedIn with inviting new networking contacts and old work colleagues to join your network. That not only expands your networking circle but also gives you access to more second- and third-degree connections through your new contacts. Read Up on Potential Employers: Identify companies for which you ultimately might like to work and follow their social media trails. That way, you can keep up to date on any jobs that might be coming open, as well as any initiatives or milestones so you can be knowledgeable at a possible interview. 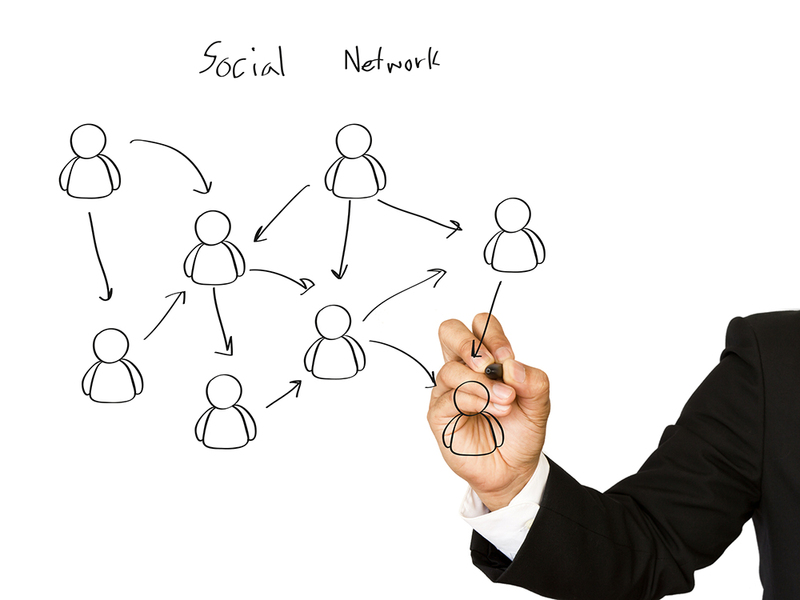 You can also find who you might be working for (or with) and see their social media presence. Familiarize yourself with their passions and views and get a gauge on their personalities. Promote Yourself…But Not Too Much: If you’re proud of a personal or professional achievement, don’t be afraid to flaunt it on your social media accounts. But, as the Muse points out, don’t come off as a braggart: “Nothing looks worse – or turns followers off more – than a Twitter stream just promoting your own thing.” Spread praise around to others in your social and work communities and show that you’re just as happy for the success of others as you are for yourself. For more tips on pursuing and enhancing professional opportunities, you can visit Columbia College’s Grossnickle Career Services Center website, call (573) 875-7425 or email careerservices@ccis.edu. Are you looking for a way to pursue a quality college education while supplementing your income with a side job? Columbia College and Uber have you covered. The two organizations have announced a unique partnership that will give thousands of Uber driver-partners around the U.S. a 15-percent discount on tuition. The discount will also be available to any current Columbia College student who signs up to drive with Uber. Tuition costs at Columbia College are less than half the national average. 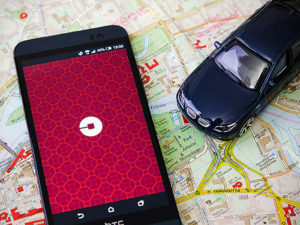 The Uber partnership provides an incentive for current students to realize another revenue stream, as well as an enticement for prospective students who just so happen to be Uber drivers. To be eligible for the tuition discount, Uber driver-partners must complete at least one trip per month. For more information about how current students interested in driving with Uber and current driver-partners interested in applying to Columbia College can take advantage of this offer, visit uber.ccis.edu.